So much yarn, so little time. 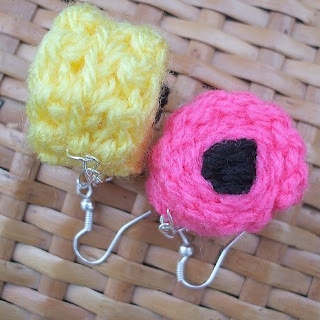 : Knitted Jewellery Giveaway! Well - actually some is crocheted, but I think you'll forgive me. Stop waffling Nifty - what do you win? Seemples! Leave a comment telling me (1) your favourite not-a-meerkat item from my Folksy shop and (2) the jewellery item you would like if you win. Don't forget to leave a way for me to contact you. Good luck - I'll draw the prize on Wednesday. Open to all - Folksy is now open to buyers from outside the UK, but not yet for overseas sellers. I *love* overseas buyers! I'm I'm loving the Mohair corsage brooch, the colour is fab and the add of the leaves make it a turly lovely brooch. Yes this is what I want to win! I like the colours and the little pot! I would like to win the pink corsage featured in your blog entry. It's really pretty and I have just the jacket for it! I am quite head over heels with your gorgeous little oast house. It's too sweet for words! And I'm also coveting your gorgeous turquoise barrette - yummy! I love the Spring Flowers in your shop, and the flower pin cushion too. 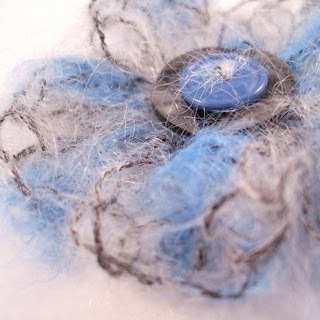 I'd like to win the aqua mohair corsage, looks so fluffy! And if I win, I would choose the pink floral bracelet or the red mohair brooch (surprise me!). I would equally love to win of one of the adorable mohair corsage brooches. I don't mind what colour(to be honest I don't think I could choose just one 'cause they are so pretty)! If I am so lucky to win you could contact me on twitter(http://twitter.com/sharonmcnally) or I should be in your list of followers somewhere. I'd prefer not to leave my email here as I want to avoid spam but I could direct message it to you if I win. I agree with sharon - please don't leave email addresses here, tooo much spam already! i love your pink corsage brooch, its so fluffy and summery. I'd love to win one. So hard to pick, I keep changing my mind! But I love the cream mohair corsage with the yellow centre, it's gorgeous - and perfect for summer! It reminds me of frangipanis, one of my favourites. It was a tough one as I love lots in your shop. http://www.folksy.com/items/34251-pin-cushion?shop=yes (but the mermaid was a close second). I love your knitted daffs, but I would love to win the fluffy scarf. I have a bit of a thing for scarves. Favourite non meerkat thing, hmmmm... too many good things to choose from - the curly scarves are fab, the pincushions and the dachshund. 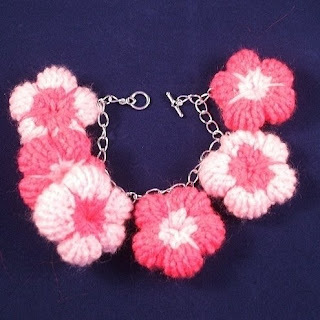 My favourite piece of jewellery is the pink flower bracelet, I love that - it reminds of those little iced midget gem biscuits my gran used to give us when we were little! I liked iced gems too - but they don't taste anything like as nice these days. Ooooh, Spring Flowers necklace (pink) and that's also what I would choose if I were a lucky girl! I love the little lion! And if I won I'd choose the Pacman necklace, it's amazing. I rather fancy the cow. And i would LOVE to win a barrette. However if that is not considered jewelry, I like the earrings too! Truth told I love everything Nifty! I love the 1st one! oh so pretty! kiss! Difficult to chose amongst such great items. However, Im a huge corsage fan and this would look gorgeous on my summer jacket. My favourite non-meerkat item is also the one I would choose - the pacman necklace. I love the corsages especially the mohair - and the pink flowery bracelet. However, due to many happy memories and hours spent (some in the last year with xboxlive) I have to say my absolute fave is the Pacman necklace! and I would love to win that item - now you know my "secret" non knit or get outside study break. A bracelet will be my choice of wining! Great blog by the way.. I'll be back. My favorite item is the yellow hair clip, and that's also what I would choose if I win. I definitely consider the hair thingies to be jewellery - and as folksy doesn't let us have categories, it's fine. The blue flowery hair barette, that'd be perfect for my daughter! I love the cream mohair corsage with the 5 skeletal leaves, that's the one I'd pick and I'd wear it all summer, even though it's spring one! Too gorgeous to hide away! Avlor (on Etsy) or avlorsimprints on Twitter. http://www.folksy.com/items/32943-Mohair-Spring-corsage i love this corsage, it's also my fave non meerkat item in your store! NON meerkat item? Well that a tough choice, especially with the Trekkie meerkats on the scene. But Ok, I pick the orange flowers hair clip! hmmm, that wasn't too hard after all! PS Item I would like to win is the same as my favorite, the orange flowers hair clip! !